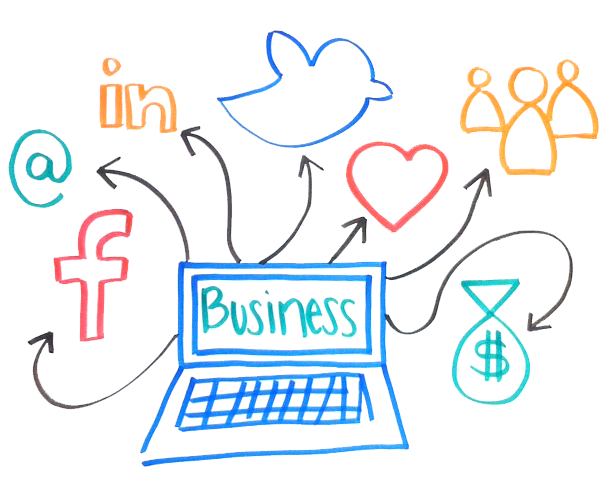 Social media marketing and social networking can help your business with its business network marketing. That’s because social media marketing will connect your business with its customers, clients, or prospects. Billions of people interact on social media every day. What’s more, each of these people has the potential to become your customer, even your promoter. Social media marketing gives you the chance to get connected with people in a personal way. Being your own brand representative on a social media platform allows you to communicate with people as a person rather than as a faceless company. If you want success with digital marketing in general and social media marketing in particular, you need to know who your customer is. Ask yourself: “Whose problem does my product or service solve?” and “Who will be interested in what I have to offer?” Answers to these and similar questions will tell you who your customers are. There are a lot of social media sites. We all know their names: Facebook, Twitter, Instagram, Tumblr, LinkedIn, Pinterest, Reddit, and more. What’s more, now that you know who your customer is, you have a good chance of knowing where he or she likes to hang out online. That platform is where you should focus your social media marketing efforts. If you do decide to market over more than one social media platform, keep in mind that different platforms require different content. At the very least, you should present the same content in different ways for different platforms, according to the protocols and etiquette of each. Set some realistic and measurable goals for your social media marketing campaign. Generally, brand awareness and conversions are two important goals most businesses aim for with social media marketing. The next step will be to develop your marketing approach. According to recent studies, many high-performing marketing teams prefer an approach that utilizes unique, original content. When you’re deciding on your marketing approach, keep in mind the reason why you’re doing what you’re doing. For example, if your purpose with your social media marketing campaign is brand awareness, consider creating content in the form of compelling videos or interesting blog posts. A successful social media marketing campaign generates goodwill for your brand. However, how does one go about generating goodwill? The simplest way to do this is to create a lot of high quality and informative content. Moreover, stick to the best practices of social media marketing. People will be attracted to your high quality content. This will lead them to appreciating your expertise. Word-of-mouth awareness about your brand will grow. And people will want to stay in touch with you by way of social media as well as elsewhere. Another good way of generating goodwill is to interact directly with people who are engaged with you on social media. Reply to their comments, conduct Q&A sessions, and respond to their reviews of your products and services. All of this will help you to grow your circles and encourage more people to engage with you. And best of all, more people will become familiar with your brand. If you choose, you can take your social media marketing to the next level with paid traffic. This can make it easier for you to expand your presence on social media. However, advertising on some social media platforms can be expensive. This can keep this tactic out of reach for businesses on a limited budget. Social media marketing is simple and can be inexpensive. In order for it to be effective, though, you must be clear about your goals. You must know what you want to achieve. However, if you are clear about your strategy and know where your customers like to hang out online, social media marketing can help you connect with the right people for your brand.